Clippings, that is. Don’t feed the horses lawn clippings. In all seriousness, I stumbled across this post by Red Rock Equine Veterinary Inc. PS and Dr. Rothschild, and, with her permission, I am sharing the information with you. It may be redundant or you may have heard this and forgotten it, but it’s so tempting to throw those fresh, green grass clippings to horses, at a deadly price. Remind neighbors, too, if you have them close-by your horses. Please be mindful, this applies to other livestock as well: goats, cattle, sheep, etc. LAWN MOWING SEASON BEWARE… Last night’s emergency: pumping out 15 buckets of fresh grass clippings from a colicky horse’s stomach! 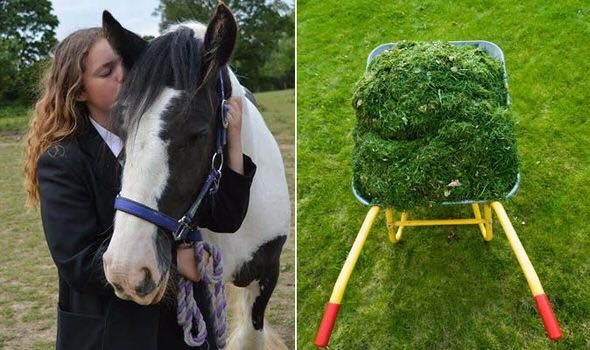 Fresh Grass clippings should NEVER be fed to horses. Such a common emergency this time of the year! Neighbor mowed the lawn and threw clippings over the fence for the horses to have a treat! Colic, laminitis, diarrhea and death are a possible result for horses eating a pile of clippings. The center of that sugary pile of grass quickly ferments especially during warm days and because it’s chopped so finely horses tend to gorge on it ingesting large amounts without barely chewing on it. Suddenly fermentation continues in their stomachs and they become gassy and colicky. Some survive the colic but lose the battle to the laminitis which often develops a few days later from the large and fast ingestion of all the sugar. Most horses that eat clippings and become a nightmare emergency were voluntarily fed the clippings by someone that had the best of intentions and thought were doing a nice thing. So make sure your neighbours and co-boarders know how dangerous this can be. Even post signs if necessary. Rake clippings when mowing the lawn or pastures or leave horses off of them for several days for it to dry-up if removing them is not possible. If you find out your horse ate a bunch of clippings don’t waste time and call your vet right away.